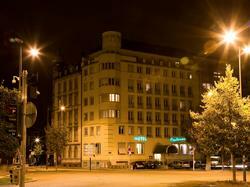 The Hotel Esplanade is ideally located in the heart of Strasbourg in the center of the university area. Only 15 minutes on foot from the famous Strasbourg Cathedral, it's a perfect place to stay whether on business or on holiday in Strasbourg. The Strasbourg tramway station just in front of the hotel will take you directly to the new high-speed train station, the European Parliament and the international Entzheim-Strasbourg Airport (tramway + shuttle service). Our warm and friendly receptionists are there to serve you round the clock. You can leave the luggage in the reception before the check-in time and after the check-out time. The breakfast buffet is served from 6:30 to 10:00 a.m. in the hotel's breakfast lounge (8€ per person). It is possible to park in the Boulevard Leblois next to the hotel (at cost from 9.00 am until 19.00 pm, free from 19.00 pm until 9.00 am and on Sundays). Buses for groups also have the possibility to park close to the hotel (in Quai des Belges). 50 rooms: single, double or triple rooms.